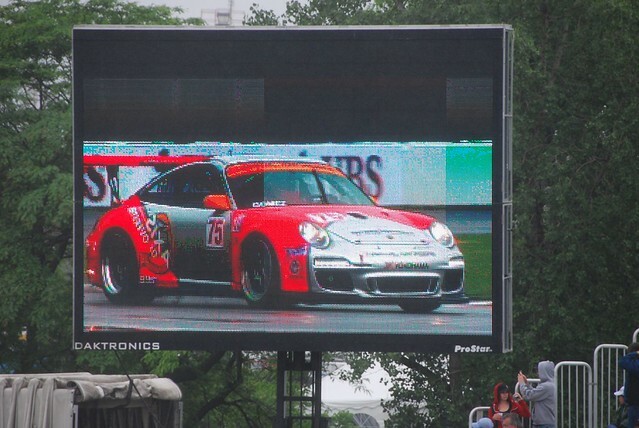 Carlos Gomez (Bogotá, Colombia) driving the Axis of Oversteer/Capital Managers 2011 Porsche GT3 Cup, scored a fantastic sixth place finish at the IMSA GT3 Challenge by Yokohama race in Montreal. The race marked the first time IMSA GT3 Challenge has returned as support to the Formula 1 Canadian GP since 2008. Gomez, on his first visit to the Circuit Gilles Villeneuve and in his first race with a Porsche GT3 Cup, started the race in P9 and survived an incident filled wet race to finish in 6th place. A remarkable performance, especially considering he had had no wet weather testing at all before the race, the first time he drove the car in the rain was on his out lap before the start! The Axis of Oversteer GT3 Cup was expertly prepared by Spencer Cox of SpeedSport Tuning and supported by the mighty TRG team. The next appointment for Carlos and the Axis of Oversteer Porsche will be at Lime Rock Park on July 9th in support of the American LeMans Series race. We hope to see many of you there and thank you again to all those who sent us pictures of the car in action! Check out the slide show after the jump and don't forget to "like" Axis of Oversteer of Facebook. Go CG go! I'm rooting for a podium at Lime Rock! See you guys at Lime Rock!!!! I'll also be at Lime Rock. Will be there Axis GT3 Cup attack T-shirts by then? Great job CG! Any in-car video from the race?